This page is a resource for all of our Downtown mechants. It is meant to help our merchants stay engaged and up-to-date on everything going on Downtown, such as new programming or marketing opportunities, economic development intiatives, holiday or special event notices and other pertient information that will help our business owners and managers be successful. On this page you will find a practical guide for doing business Downtown, information on who to call for various topics or concerns, our quarterly newsletters and information on new parking programs, such as the employee parking program that is being finalized and tested this summer. Thank you for choosing Downtown Delray Beach for your business! We are looking forward to working with you. The DDA 2015-16 Annual Report is available! Downtown is our City’s meeting place and the symbolic heart of our community where many areas of activity are represented. Downtown is a thriving business center; a fun & vibrant retail center; a cosmopolitan residential center, where residents enjoy living as a part of the rich energy of urban life; and an ethnically and generationally diverse community. Distributed to property owners, business owners and residents within the DDA’s district, the Report details the Position Marketing, Placemaking, and Economic Development activities from the past year and in addition provides a snapshot into 2015-2016. In addition the DDA has created a video about who we are, what we do, and how we can help you. Click here to view. Attn: All Downtown businesses. You are all invited to be a part of Delray Beach Fashion Week's 5th Year Anniversary. Delray Beach Fashion Week is an internationally, award-winning event that will be held January 24-28, 2018. If you are interested in participating or being a sponsor of this event, please contact the DDA office at DDA@DowntownDelrayBeach.com or (561) 243-1077. Click here to view the Retail Participation Form. Click here to view the Hair Salon Form. Click here to view the 2018 Sponsorship Packages. Businesses throughout the Delray Beach community have been impacted by Hurricane Irma. As you work to assess the impact on your employees, property, inventory, equipment and operating revenue, here are a few resources that may help you during the recovery period. We stand ready to assist you and your employees – let us know how. Click here to view the resource guide. Advertising is available in the 2018 Guide to Downtown Delray Beach. Click here to view the 2018 Media Kit. 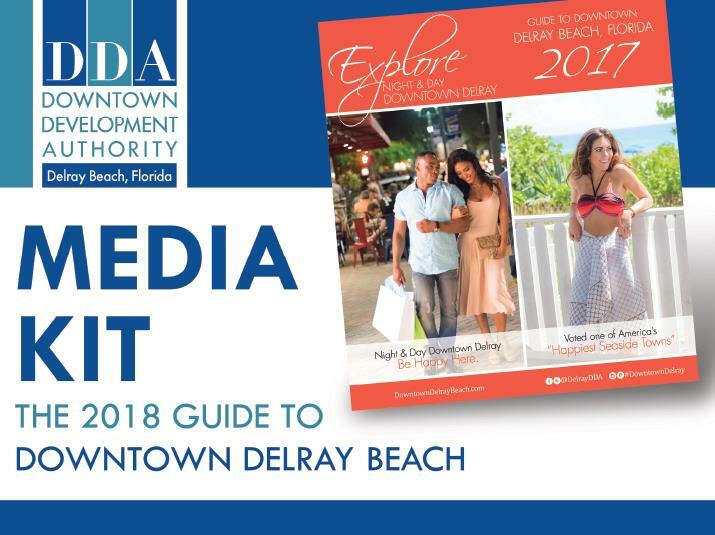 If you're interested in advertising in the 2018 Guide to Downtown Delray Beach, contact the DDA office at DDA@DowntownDelrayBeach.com or (561) 243-1077. We need your feedback on the pilot program. Click here to learn more about the pilot program. 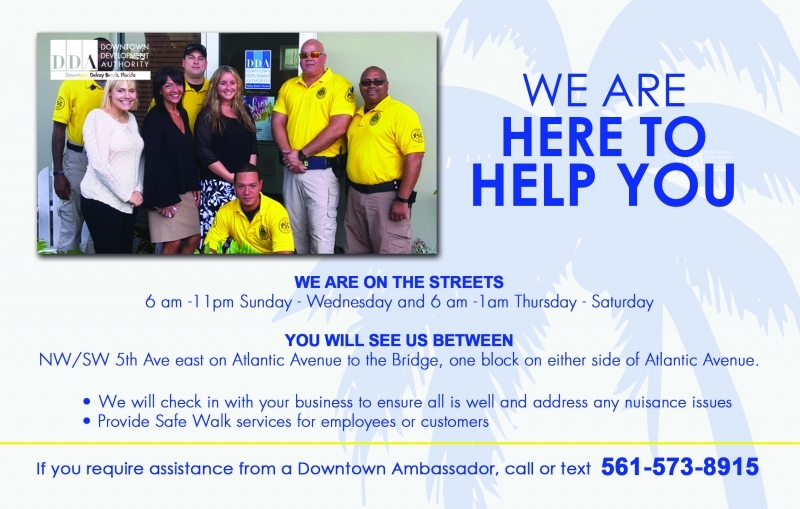 If you are a Downtown resident, property owner, business owner or visitor, send a letter or email about this pilot program to: DDA@DowntownDelrayBeach.com and/or click here to take the Downtown Ambassador SURVEY. Robert J. Gibbs delivered a riveting presentation at our annual Town Hall Meeting on April 19, 2017 at the Delray Beach Marriott, with valuable research & recommendations for our Downtown Business & Property Owners as well as our city's decision makers. 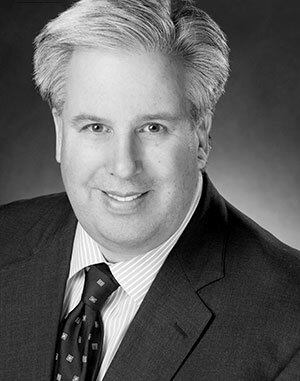 "New Trends in Urban Retail Planning and Development" by featured speaker, Robert J. Gibbs, AICP, ASLA, CNU-A, President, Gibbs Planning Group was recorded & is available online. Click here to watch the presentation. The Downtown Merchant & Business Association consists of restaurant, business, and retail owners or operators from the Downtown (DDA) district (I-95 to the beach and within Pineapple Grove area as well as South of Atlantic). If you are a Downtown business owner or operator within the District, you are welcome to join the DMA free of cost. To provide a forum for the downtown businesses to collaborate on programs, communicate amongst the organization and community, and be a collective voice that advocates for activities that promote the retention and smart growth of the downtown business community. Next DMBA Meetings are held at Northern Trust Bank (770 E Atlantic Ave) at 8:30 a.m.
- Thursday, December 14, 6 p.m. – 8 p.m.
Click here to fill out the Downtown Business Intake Form for DDA record keeping purposes and to ensure that you are included in all of our listings, marketing, programming opportunities and outreach efforts. This form is for merchants in the Downtown District only. If you are unsure of whether or not your business is within the Downtown District borders, please contact the DDA office at 561.243.1077. Please send your completed forms to: DDA@DowntownDelrayBeach.com. All merchants within the Downtown District receive a full merchant landing page on this new website for Downtown DelrayBeach. Merchants will be able to upload photos, videos, promotions, events and so much more to their merchant landing page. This new site also offers enhanced visibility & searchability for all of our Downtown merchants. Additionally, it has a mobile-friendly & responsive design! •Neighborhoods within the Downtown District (i.e. Pineapple Grove, The Set [West Atlantic], Beachside, SOFA [South of Atlantic], US1 and Arts & Entertainment). Click here to view the new Website Features Presentation & Login Instructions. If you haven't received your website login information for your merchant landing page, please contact the DDA office at 561.243.1077 or DDA@DowntownDelrayBeach.com. The Downtown Development Authority is proud to partner with VUP Media in offering this unique and affordable business profile video package for our Downtown Merchants (within the DDA District). Take advantage of increased exposure to potential customers, by marketing your business everywhere! We have been able to leverage this opportunity for you at an extremely cost efficient price point of only $425 per video profile (a $2,500 value). Each business profile includes an on-location HD shoot of your business, HD post-production editing, business profile video (up to 2 minutes in length). Click here to view details & pricing. Click here to view existing Business Profile videos. If you are interested in having a Business Profile video created for your business, please contact the DDA Office at 561.243.1077 or DDA@DowntownDelrayBeach.com. The city of Delray Beach has implemented an emergency notification system to provide critical information to residents and businesses in emergency situations. The CodeRED system, capable of placing sixty thousand calls per hour, can call all persons registered with the service or just those located within an affected area, making up to three attempts to reach each number. Click here to register & learn more. The busy season in South Florida is winding down and summer is on the horizon, so it’s no coincidence to us that Mental Health Awareness Month is in May. It’s easy to get stuck in a routine with a schedule full of work, school, family and other personal commitments without ever taking a moment for a little R&R. Whether you prefer hitting the gym, getting pampered or simply being one with nature, take some time this month to take that much-needed mental break, right here in Downtown Delray Beach! Here’s five top ways to unplug and practice positive mental health and wellness in #DowntownDelrayBeach! Set up a nice playlist, plug in your headphones and get moving! Taking a walk, run or bike ride along the beach is an easy way to increase your energy and revitalize your mind and body. If you’re looking for more structure, there’s always the option of hitting a gym or fitness studio and lucky for you, we’ve got plenty of options. Barre Envy, PurLife, Ride Delray and Slash Fitness are just a few places in Downtown Delray where you can work up a sweat and release the stress. There’s nothing like the great outdoors and we’ve got the options to prove it! If the waves are calling your name, then Delray Beach is where you need to be. What’s better than swaying palm trees, the feel of the sand beneath your feet and sound of crashing waves to help you relax. We also have plenty of parks throughout Delray Beach, perfect spots for you to take a few moments to yourself. Veteran’s Park also provides a serene environment with a perfect view of the intracoastal waterway. Bring a blanket and book or word puzzle to stimulate your mind or set up an impromptu yoga session. ​If you’re feeling competitive, then participating in sports is a great way to get the adrenaline going. The Delray Beach Tennis Center is friendly enough to make you feel at home, with courts large enough to make you feel like you’re playing alongside the greats. Play a casual game among friends or take a lesson from one of their instructors. If quiet precision is your style, then playing a round at Putt’n Around is exactly what you need. So, grab a snack and hit the course. What better way to release the stress than to fine-tune your body? Enhancing your health and overall wellbeing is the most important way to practice positive mental health. Whether it’s a trip to Foot Haven Reflexology Bar or Acupuncture Zen, you’ll walk away anxiety-free and ready to take on the world! Sometimes if you need a refresher, a Delray Beach staycation provides the perfect mental getaway. Here in Downtown Delray Beach, we’ve got everything you need including hotels, restaurants, art galleries and museums. Put on your tourist cap and explore this village by the sea. Need some inspiration? Stop by our brand-new Visitor Information Center & grab some guidebooks while talking to our knowledgeable staff about all the hidden treasures you can experience in Downtown Delray Beach. Delray Beach, FL (April 4, 2018)…The Delray Beach Downtown Development Authority(DDA) hosted the Annual Town Hall Session for Property & Business Owners – “State of the Downtown”- on Thursday, March 29, 2018 at 6:00 p.m. at the Crest Theatre at Old School Square. DDA Board President Peter Arts welcomed the more than 150 guests, followed by Laura Simon, Executive Director who shared the mission and focus of the organization – marketing of the Downtown District, placemaking, and economic vitality. She also included highlights of Delray Beach Fashion Week, the Downtown Security Ambassador Pilot Program and Savor the Avenue. Through the Retail Market Analysis, provided the categories of retail/restaurants that are supportable within the Downtown. Providing strong recommendations from the customers point of view regarding ways to enhance the Downtown shopping experience including first impressions, and how important these are for a return visit. Downtown Delray Beach has a walkability score of 92 out of 100 - among the highest in the nation. Reviewed all master plans, land development regulations, codes, parking regulations, and signage, and provided short, medium and long-term recommendations to create the #1 Downtown in the US. To view the complete reports, please visit: www.DowntownDelrayBeach.com/Research-Data. The DDA is appreciative of Dada and Dr. Doodles Donuts for providing refreshments at the Property & Business Owners Town Hall. About the Downtown Delray Beach Retail Market Study: The report includes a written and illustrated summary of relevant population and demographic characteristics of the Downtown trade area, including the socioeconomic characteristics and buying patterns; and a qualitative opinion as to whether or not retail development is supportable, sales forecasts, and size estimates of the retail categories. For more information, please contact the DDA by email DDA@DowntownDelrayBeach.com or call 561.243.1077. DOWNTOWN DELRAY BEACH PROPERTY & BUSINESS OWNER ANNUAL TOWN HALL SESSION THE PUBLIC IS WELCOME! Delray Beach, FL (March 16, 2018)…The Delray Beach Downtown Development Authority(DDA) will host the Annual Town Hall Session for Property & Business Owners – “State of the Downtown”- on Thursday, March 29, 2018 at 6:00 p.m. at the Crest Theatre at Old School Square, 51 N. Swinton Avenue, Delray Beach. The public is encouraged to attend this event featuring Robert Gibbs, Gibbs Planning Group who will present the results of the Downtown Delray Beach Downtown Retail Market Study and the Downtown Shopability Analysis. Downtown Delray Beach Retail Market Study: The report includes a written and illustrated summary of relevant population and demographic characteristics of the Downtown trade area, including the socioeconomic characteristics and buying patterns; and a qualitative opinion as to whether or not retail development is supportable, sales forecasts, and size estimates of the retail categories. To RSVP, please contact the DDA by email DDA@DowntownDelrayBeach.com or call 561.243.1077. To view the report: www.DowntownDelrayBeach.com/Research-Data.